Zero Water, concentrated Formula contains no petroleum or mineral oil. All you need is just a drop! Ideal for extremely dry, cracked, irritated eczema skin. 100% Natural and Organic! Preservative and Dye free. Handmade and formulated by pharmacist in Texas USA. 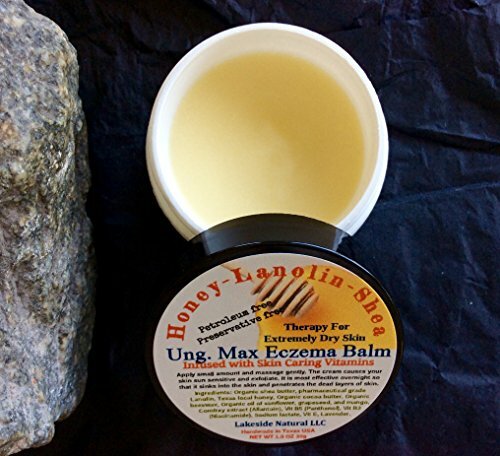 The product features Honey's natural healing power for Eczema. It contains 10% Texas local honey. Plus organic Shea & Cocoa butter, an excellent skin moisturizer, does more than just hydrate the skin - it helps actually heal it from the inside out. It also is a significant source of polyphenol and flavanoid antioxidants that protect skin from free radical damages. Plus pharmaceutical grade lanolin; lanolin creates moisture barrier to lock in moisture and helps other ingredients and vitamins penetrates the dead layers and sink into skin overnight. This cream is a creation by proprietary bridging technique that requires no addition of chemicals such as binders, preservatives, or emulsifiers. It frees from the burdens of store bought chemicals. A little goes a long way! * This product contains sodium lactate that exfoliates thick layers of scaly dead skin but it can cause skin sensitivity (photo sensitivity), so it is best to be used before bed at night or avoid sun and ultra violet (UV) light exposure.